When one sees the name Wong Kar-Wai at the top of the credits of a film, it is easy to know what to expect. 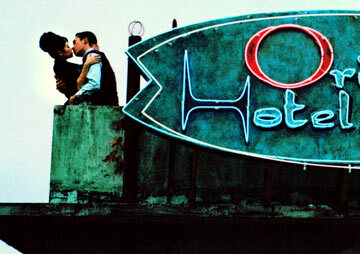 Wong (Eros, In the Mood for Love) has a gift for capturing mood on film. There is so much that it feels like it is seeping off the screen and into the audience. Typically, the moods presented are of unrequited love or longing, with a hint of sadness lurking just under the surface. 2046 is no exception. The film looks as beautiful as ever. It's the plot that is lacking. Some my accuse Wong of going over the edge here. There is so much focus on how dress, backgrounds, and lighting that a coherent plot never emerges. Everything unfolds like a convoluted dream. A beautiful one, but still convoluted. 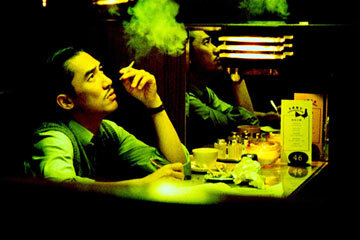 Wong returns to the character of Chow Mo Wan (Tony Leung, Infernal Affairs, Hero), the protagonist of In the Mood for Love. 2046 finds him a different person. He is jaded and bitter after running away to Malaysia after meeting Su Li-Zhen (Maggie Cheung, Hero, In the Mood for Love). Cheung makes an all-too brief appearance here. So Chow, now a writer, holes himself in his hotel room and begins writing a story. He also embarks on a series of flings with various women. The narrative jumps back and forth in time, characters mix, and things begin to jumble. He has a torrid affair with Bai Ling (Ziyi Zhang, House of Flying Daggers, Purple Butterfly), a prostitute. They are falling in love with each other, but construct artificial barriers to prevent any sort of emotional attachment. He also has brief flings with Lulu (Carina Lau, Infernal Affairs III, Mighty Baby), a singer he knew from before. He also listens to Wang Jin Wen (Faye Wong, Chinese Odyssey, Chungking Express), the hotel owner's daughter, as she practices her Japanese. He falls for her, as well as for Su Li-Zhen (Gong Li, Eros, Zhou Yu's Train), the other's namesake. His experiences blend into this story, and Wong blurs the lines between what is real and what is fiction. So what exactly is 2046? It is the room that Lulu stays in. She was his first fling in 2046, and he moves into 2047. It is also the title of his novella, which takes place in the year 2046. The premise is that there is train that goes to a place where people can relive their memories. Writing about these memories prompts some of the flashbacks that Chow has. On the train are some androids (played by some of the women) move in a stilted manner, trying to find some emotion. On a more symbolic level, 2046 is when China will regain complete control of Hong Kong. There is almost a feeling of pretentiousness that would be more overt if 2046 were not as beautiful as it was. The colors shimmer, and the setting of 1960s Hong Kong allows Wong to dress his cast up in slick clothing with elaborate hairstyles. Everybody looks exquisite. And Wong varies the music motifs to match the moods of each scene. He is working with longtime collaborators Christopher Doyle (Eros, Green Tea) and Shigeru Umebayashi (House of Flying Daggers, Zhou Yu's Train) which provides for a sense of continuity. Doyle is Wong's amazing cinematographer, who is able to bring such lovely images to life in all of Wong's films (but he cannot act - see the truly bizarre Andromedia). Wong used Doyle and two additional cinematographers, Lai Yiu Fai (All Tomorrow's Parties, Infernal Affairs) and Kwan Pun Leung (Lavender, The Island Tales) for added effect. All this is barely enough to mask the fact that it is very difficult to understand what is happening on screen, and as a result, very hard to care about the characters. 2 hours, 9 minutes, Mandarin, Cantonese, and Japanese with English subtitles, Rated R for sexual content.